A crater caused by the LNA’s airstrike on Mitiga airport yesterday photographed by AFP’s Mahmud Turkia (AFP/Mahmud Turkia). Libya’s Airports Authority announced last night that Mitiga airport will reopen today as evidence of its possible military use emerged overnight. Flights from Mitiga will be restricted and will only operate during the evenings from 19.00 to 7.00 – until further notice. Flights at Misrata will continue as normal. 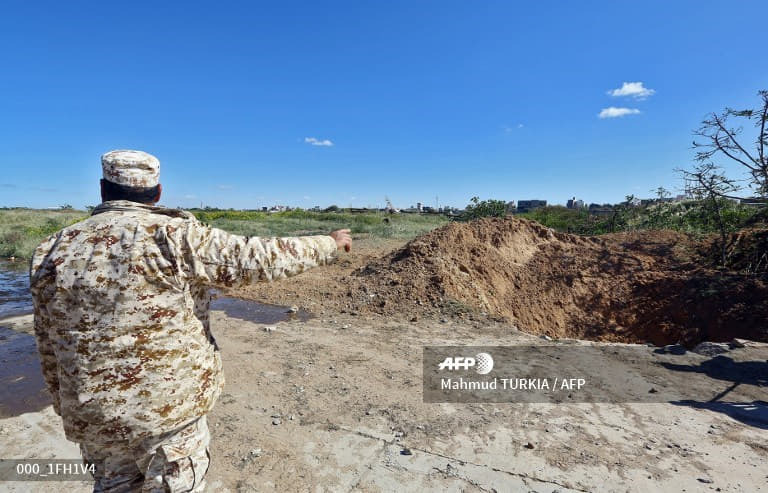 The reopening of Mitiga comes as evidence of its possible military use emerged and the reasons why Hafter’s Libyan National Army (LNA) may have targeted it yesterday may have became more evident. AFP photojournalist, Mahmud Turkia, was able to slip into Mitiga yesterday and locate the crater caused by the LNA airstrike. He found a Chinook CH-47 helicopter intact and still in situ about 20 metres away from the LNA crater – possibly partly damaged by shrapnel. 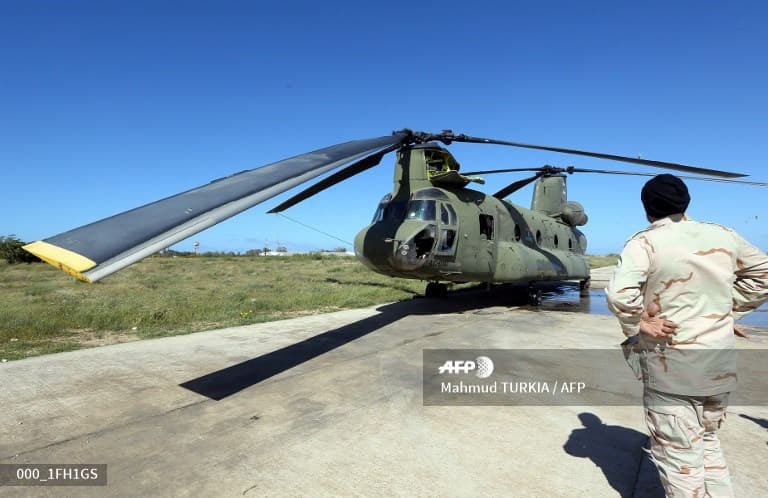 A Chinook helicopter at Mitiga airport yesterday (Photo: AFP/Mahmud Turkia). However, Tripoli sources have confirmed to Libya Herald today that at least one more Chinook CH-47 was situated nearby and was hit and caused more severe damage by the LNA airstrike. It was apparently quickly removed and hidden from sight before it could be photographed. It is unclear how badly it was damaged. It will be recalled that Mitiga was evacuated and closed to all flights yesterday after it was hit by an airstrike by LNA fighters at around lunchtime. UNSMIL head Ghassan Salame yesterday condemned the airstrikes. Mitiga is Tripoli’s only functioning airport available for civilian use. ‘‘As such’’, Salame had added, ‘‘this attack constitutes a serious violation of international humanitarian law which prohibits attacks against civilian infrastructure’’. However, Salame’s statement had omitted to add that the Mitiga airport complex is a multi-purpose complex, being a prison and a military airbase. It was, after all, the former American Wheelus airbase and an Italian airbase prior to that in the thirties. The dual civilian-military use of airports is common in many of Libya’s airports. All flights had been cancelled with those returning or on route were diverted to Misrata. There were no casualties reported. At a press conference at Mitiga airport yesterday, the head of the Airports Authority Mohamed Bait al-Maal, called on ‘‘all parties to spare airports the military conflicts as these are facilities serving all Libyans regardless of their political orientations’’. He also wished for the safety of all the people of the Qasr Ben Ghashir area and all his colleagues living in the vicinity of the Tripoli International Airport from the clashes in the area.